As chemistry teachers plan activities for their students, AACT will highlight resources from our high school library that help to reinforce topics in different units throughout the school year. Our last news post highlighted resources from our high school library that could be used to support a Kinetics unit. We will now focus on lessons and other activities that could be used in an Equilibrium unit. Since our original post in April 2018, we have added a few more resources that you might consider trying with your students. Additionally, we have created a unit plan that uses many of our resources to help you teach a unit on Equilibrium. 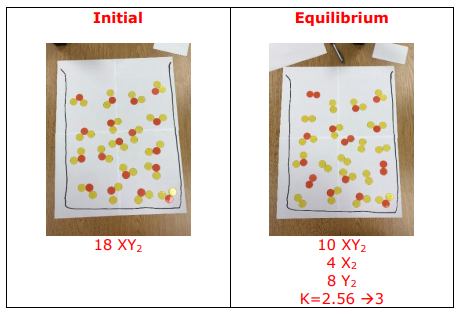 The AACT simulation, Predicting Shifts in Equilibrium: Q vs K allows students to take a 15 question quiz to help them reinforce their understanding of shifts in equilibrium through the comparison of Q and K. Each quiz question has two parts. The first part requires the student to calculate the value of the reaction quotient, Q. The second portion of the question requires students to compare the value of Q to the equilibrium constant, K, and to predict which way the reaction will shift to reach equilibrium. The simulation includes five different reactions which each have three scenarios: Q > K, Q = K, and Q < K.
Part two of the lesson plan uses the demonstration, Milk of Magnesia Magic to connect the concept of equilibrium to indicators, acid/base chemistry, limiting reactants, and reaction rates. In this demonstration, students observe a color change in a milk of magnesia solution as vinegar is added. By the end of this demonstration, students should be able to understand that a chemical change is taking place, recognize that an indicator causes a color change, realize that an acid base reaction occurs, identify the limiting and excess reactants during the reaction, and apply Le Châtelier’s principle to explain the color change. This lesson includes alignment with the AP Chemistry Big Ideas. Students often form misconceptions about equilibrium and what happens at the particle level during the process. Use the activity, Equilibrium in a Beaker to help them model equilibrium reactions using plastic chips to represent atoms. The goal of the lesson is to connect the symbolic model of an equilibrium reaction to its particle model. Read more about this lesson in an article from the November 2018 issue of Chemistry Solutions. This lesson includes alignment with the AP Chemistry Big Ideas and NGSS performance expectations. If you teach equilibrium after teaching kinetics and thermochemistry, the following resources can be used to help students make important connections between the topics. Students understand the connections between the equilibrium constant (K) and the reaction quotient (Q) as well as how they determine the favorability of a reaction in the lesson plan, Making Connections in Kinetics, Equilibrium, and Thermochemistry. Additionally students will be able to determine if a reaction is kinetically favored or thermodynamically favored. This lesson includes alignment with the AP Chemistry Big Ideas. In the Kinetics and Equilibrium lab, students investigate the reaction of the hydrogen sulfite ion (HSO3-) and the iodate ion (IO3-) to determine the effect that changing concentration and temperature has on the reaction rate. This lesson includes alignment with the AP Chemistry Big Ideas and NGSS performance expectations. We hope that these activities can help you to reinforce several of the topics covered in a unit about equilibrium. Most of these lessons were made possible by great teachers who shared their own resources. We need your help to keep the collection growing. Do you have a great demonstration, activity, or lesson related to this topic that you would like to share with the community? Please send it along for consideration. Kim Duncan received her BS in Chemical Engineering from Georgia Institute of Technology and began her career as a chemical engineer for the Department of the Navy. Later, Kim received her M.S. in Secondary Education from Marymount University and taught physics and all levels of chemistry in Northern Virginia for 14 years. She joined the Education Division of ACS as a K-12 Professional Learning Associate in 2015. Currently, she is the Senior Professional Learning Associate for ACS. Follow Kim on twitter: @chemduncan.